Roomba 650 does the vacuuming for you. The robot utilizes AeroVac Technology, maximizing air flow through its cleaning head to pull hair and debris off the brushes and into the bin evenly. Perfect for homes with pets or without, Roomba cleans deep to pick up dirt, hair, fur, and other debris. The newly designed larger bin requires emptying less often and the innovative composition of the robot’s longer-lasting brushes allows it to handle fibers such as hair more effectively, making maintenance quicker and easier than ever. Roomba can easily be scheduled to clean whenever you want—up to seven times per week. The included Virtual Wall confines the robot to specific rooms and areas and Roomba automatically returns to its Home Base to dock and recharge between cycles. All you have to do is press “Clean” and let the robot do the work. 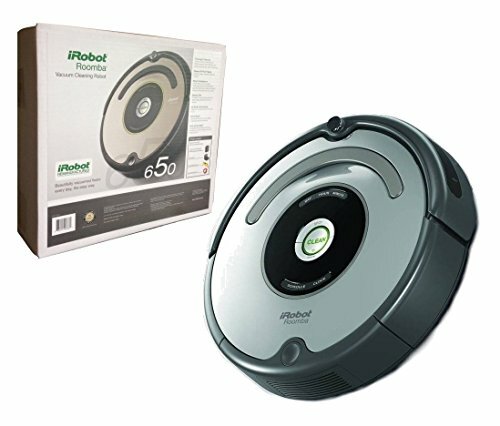 Included: iRobot Roomba 650 Robot, Grey (factory reconditioned) 1 virtual wall (Takes 2 C batteries, not included) battery (installed) charging dock power cable 1 filter (installed) brush cleaning tool user manual full 90 day manufacturer warranty.